So last week I went on a trip to visit a very good friend of mine. He can’t see very well and he is addicted to wearing overalls, but he is a great dancer and is the life of the party wherever we go (especially with the younger set). Any-who, we were walking down Fremont street together and he asks me a fairly straight forward question. 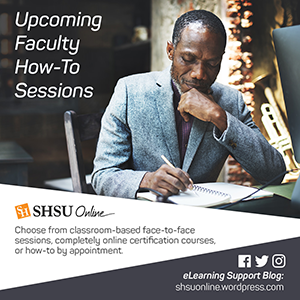 I smiled back at my friend the minion and told him that was a question we get often at our Technology Support Desk for SHSU Online. We strolled along together while I tried my best to answer his question. Well, my friend the minion liked the answer so much he asked me to share it with you. So, with this blog post, I shall attempt to do so. Traditionally our support desk has leaned heavily toward one particular browser, Mozilla Firefox when answering this question. While I still think that Firefox is probably the best answer from a stability and fails-the-least-with-all-of-Blackboard’s-bells-and-whistles standpoint, the real answer is more nuanced than that. This zen-like statement on viewing Blackboard via the lens that we call our Internet browser is almost mind-blowing. It seems like something that “the Dude” would have uttered. If you think about it though, it is true. Internet browsers are on an accelerated development schedule. They receive updates sometimes weekly in order to be sure that they are safe & secure to use for netizens across the globe. Blackboard, on the other hand, receives updates officially twice a year for the most part (not counting any cumulative patches your institution decides to apply). The update disparity here is clear. You can already see where the pain points might happen when a browser is updated as often as they seem to be. 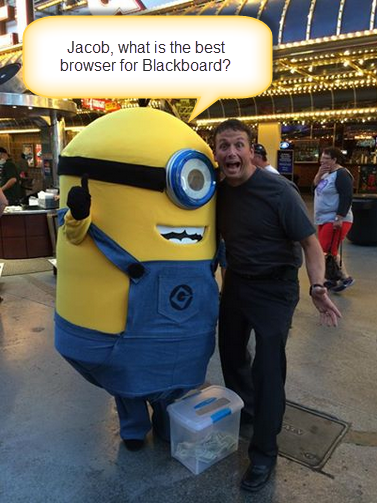 If one browser’s update messes with how you interact with Blackboard Learn, then try another. Sometimes you may be on a deadline and “It’s my Blackboard and I want it now!” In this case, just being able to launch another browser rather than making sure you clear your cache, delete your cookies and cleanse any temporary Internet files, makes life easier. This is why it is important to have a stable of tools you can turn to when the need arises. For PCs, your browser list for Blackboard should be: Internet Explorer, Mozilla Firefox & Google Chrome. For Macs: Safari, Mozilla Firefox & Google Chrome. Blackboard even provides a supported browser list that will work with your particular version of Blackboard Learn. Well, the minion and I had a great visit. I also visited a few more of my friends and they too had some questions that might interest you, but I’ll save those for another blog post.